I turned 40 this year. I didn't buy a sports car. Instead, I ran my first marathon. The race was yesterday. 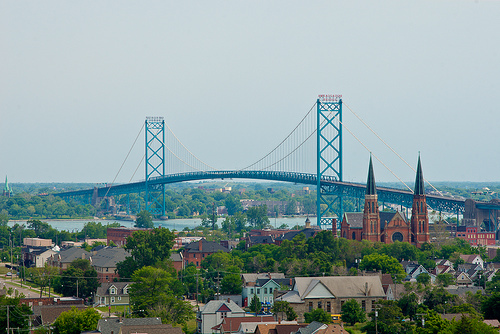 We ran across bridges and borders and through the streets of Detroit cheered on by great friends and perfect strangers. I'm happy with my results. At 3:08:53, I qualified for Boston and showed all those young whippersnappers that us old folks still got game. So, before the experience fades into memory, I'd like to record a few insights. First, the marathon challenges the mind, not just the body. And, I'm not talking only about grit, determination, and pacing strategy. Selecting a training program is critical. I found the run less, run faster system of FIRST (and my Forerunner 305) to be a perfect fit. Diet also counts, and in this I adhered to the mantra: Eat food. Not too much. Mostly plants. Second, the marathon is emotional. An injury or mishap at any moment during training or in the race can end the quest. Fear and loneliness coexist with hope and exhilaration. But, if you're lucky, you're not alone. I am truly humbled by the unexpected outpouring of support I received from friends and family. I'm not sure if I'll run another. Right now, I'm ready to shift focus: less jogging, more blogging. But, I'm so happy that I had the chance to do it once. Thanks to everyone who made the Detroit Marathon such an amazing experience! Peter, cheers to your great achievement. I'm so proud of you! You are an inspiration to get me off the couch... perhaps not going so far as 26 miles, but at least around the block once or twice. Congrats old man! It's very exciting to have completed a marathon. You are right about it testing the mind as well as the body. It's an intense 5-months of determination and strength and definitely worth it. Once you've done it, you really feel like you can do anything. I completed my first marathon in Philly in 2008. When I was finished I was so excited to have completed it within my goal time and without injury. I too, did not know if I would run another, but after a few months of recover and reflection I'm happy to say I'm now a marathoner.